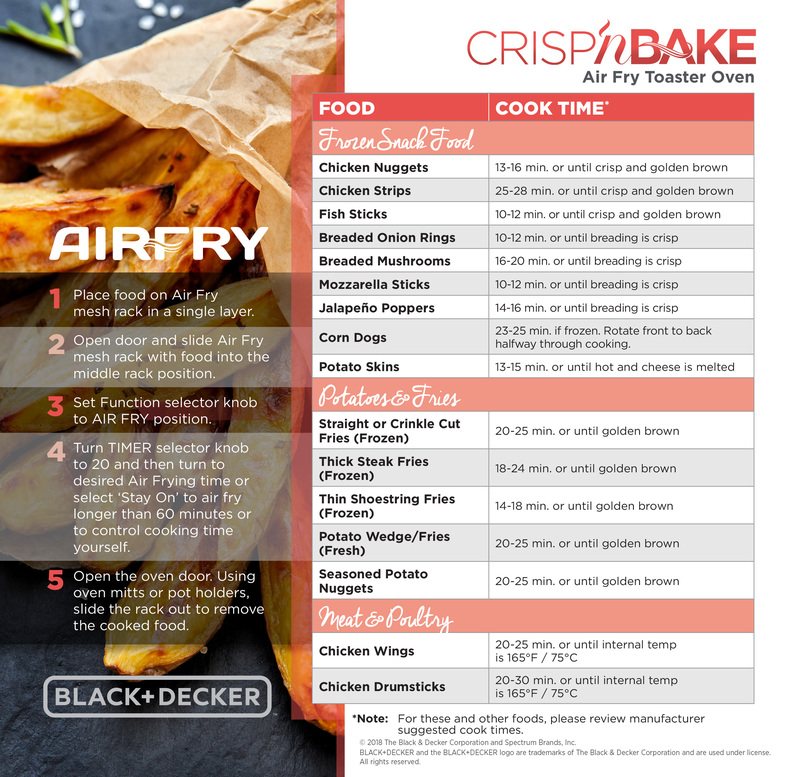 Introducing Air Fry Technology, new in the BLACK+DECKER Extra Wide Crisp 'N Bake Air Fry Toaster Oven. This is deep fried taste without the fat! Air Fry Technology uses high intensity hot air to bake, brown, and crisp your favorite fried foods with little to no oil. Try French fries, veggie chips, breaded fish fillets, frozen snacks, and a lot more! The extra large capacity fits food for the whole family. There's space for up to eight slices of bread or a 12" pizza, and you can use the pans you already have! With room for a 9" x 13" pan with handles, you can go straight from oven to table. Three control knobs make it easy to set the toast timer and 60-minute timer, and choose from five cooking functions: bake, broil, toast, keep warm, and air fry. Convection technology circulates air within the oven for fast and even results when air frying. Plus, this toaster oven includes an air fry basket, bake/broil pan and rack, and an external crumb tray that slides in and out to make cleanup a breeze. Extra Wide Crisp 'N Bake Air Fry Toaster Oven is rated 3.4 out of 5 by 71. Rated 3 out of 5 by Homemaker65 from Does not work as stated it would. I just bought two (2) 12 inch pizza pans but they do NOT fit inside the oven. The instructions clearly state that you can make a 12 inch pizza in here. That is one reason why I bought this oven. I could have purchased other brands the make the same claim. I am very disappointed is this feature. Rated 3 out of 5 by Leesea from Needs better directions I made chicken wings...they were good but the oven was a mess to clean and started smoking. Directions are vague. Rated 2 out of 5 by SeeHawk from Giving mine to Charity! I have had mine for 3-4 months and the BEST thing about it is it's "looks" - nice design, BUT just like my past Toaster Ovens when I test the Temp it is always off 50-100 degrees and it will NOT hold a temp you want it at....also, the Timer is OFf too, so you have to use a separate reader for both. I'm tired of it! Bought a different one today and it passed the Temp test already......GOOD Luck with yours! Rated 3 out of 5 by yuns from Great Air fryer Love air fryer, lots of items we've tried and all were great. BUT no instructions for fryer and why do ALL toaster ovens have CHEAP trays and drip pans. After a month of so the pans look like their years old and will not clean up. also this model does not have a full sized baking tray. Rated 5 out of 5 by Gsr1861 from First time Made my first batch of air fried wings and couldn’t believe how crisp they turned out in 30 minutes. ....used Shake n’ Bake with no oil for my first experiment. It works! Rated 2 out of 5 by disappointed1212 from directions Is there any way to receive directions on the air bake feature of this oven? Can't believe nothing came with the oven. Rated 4 out of 5 by Bombshell from Room for a little improvement The appliance itself is a keeper! However, it really needs a better manual, if what it came with could even be called a manual. Plus, the drip pan is too small and the finish on it stains beyond cleaning after a couple uses; however, a small cookie sheet from the Dollar Tree is a better replacement anyway. Thank you for your question. The temperature is listed first in Fahrenheit and then in Celsius. how do you toast both sides at once? &nbsp;and how do i register for waranty? Unit shuts off when timer goes off unless you set it to the stay on position. just got this toaster oven and noticed there is a small clip on the inside left side. can you tell me what that is for? It's to keep the rack from unintentionally being pulled all the way out. Does the bake/drip pan and rack stay in oven when using the airfryer basket? I would say &quot;no&quot;. I left mine in place for the first couple of times that I used it to try to keep it cleaner, but didn't have great results. Got much better results by leaving the drip pan out - it doesn't impede the air circulation. I haven't made toast in mine yet, but I'm guessing that you would just use the rack. The tray would be more suitable for baking/roasting. When using the air fryer, do you use the degrees and if so how? Example, if I want to set it at 320 degrees, and I have it set on air fry, how does that work? Thank you!